Ghee is a class of clarified butter that originated in ancient India and is commonly used in South Asian, Iranian and Arabic cuisines, traditional medicine, and religious rituals. Traditionally, ghee Sanskrit: गोघृत, go-ghṛta is always made from the milk of cows, which are considered sacred, and it is a sacred requirement in Vedic yajña and homa (fire sacrifices), through the medium of Agni (fire) to offer oblations to various deities. (See Yajurveda). Fire sacrifices have been performed dating back over 5,000 years. They are thought to be auspicious for ceremonies such as marriage, funerals, etc. Ghee is also necessary in Vedic worship of mūrtis (divine deities), with aarti (offering of ghee lamp) called diyā or dīpa and for Pañcāmṛta (Panchamruta) where ghee along with mishri (mishri is different from sugar), honey, milk, and dahī (curd) is used for bathing the deities on the appearance day of Krishna on Janmashtami, Śiva (Shiva) on Mahā-śivarātrī (Maha Shivaratri). There is a hymn to ghee. Ghee is widely used in Indian and Pakistani cuisine. All over India and Pakistan, rice is sometimes traditionally prepared or served with ghee (including biryani). In Rajasthan, ghee is eaten with baati. All over north India, people sometimes dab roti with ghee. In Bengal (both West Bengal and Bangladesh) and Gujarat, ghee is served with khichdi, which is an evening meal (or dinner) of rice with lentils cooked in curry made from yogurt, cumin seeds, curry leaves, ghee, cornflour, turmeric, garlic, and salt. Ghee is also used to prepare kadhi and used in Indian sweets such as Mysore pak, and different varieties of halva and laddu. Pakistani cuisine and Punjabi cuisine prepared in restaurants uses large amounts of ghee. Naan and roti are sometimes brushed with ghee, either during preparation or while serving. Ghee is an important part of Punjabi cuisine and traditionally, the parathas, daals, and curries in Punjab often use ghee instead of oil, to make them rich in taste. Different types of ghees are used in different types of cooking recipes; for example, ghee made from cow's milk (Bengali: গাওয়া ঘী, gaoa ghi) is traditionally served with rice or roti or just a generous sprinkle over the top of a curry or daal (lentils), but for cooking purposes, ghee made from buffalo's milk is used generally. A traditional Ayurvedic recipe for ghee is to boil raw milk, let it cool to 110 °F (43 °C),. After letting it sit covered at room temperature for around 12 hours, add a bit of yogurt to it and let it sit overnight. This makes more yougurt. This is churned with water, to obtain cultured butter, which is used to simmer into ghee. Ayurveda considers pure un-adulterated ghee to be sāttvik or sattva-guṇi (in the "mode of goodness"), when used as food. It is the main ingredient in some of the Ayurvedic medicines, and is included under catuh mahā sneha (the four main oils: ghṛta, taila, vasā, and majjā) along with sesame oil, muscle fat, and bone marrow. Ghee is used preferentially for diseases caused by Pitta Dosha. Many Ayurvedic formulations contain ghee, for example, Brāhmi ghṛta, Indukānta ghṛta, Phala ghṛta, etc. Though eight types of ghee are mentioned in Ayurvedic classics, ghee made of human breast milk and cow's ghee are claimed to be excellent among them. Further, cow's ghee has medhya (intellect promoting) and rasāyana (vitalizing) properties. Ghee is also used in Ayurvedas for constipation and ulcers. Vechur cow Ghee produced using Vechur cow’s milk, is famous for its high medicinal values due to the presence of A2 beta-lactalbumin protein and higher arginine content which is good for the health of convalescing people. Indian restaurants and some households may use partially hydrogenated vegetable oil (also known as vanaspati, dalda, or "vegetable ghee") in place of ghee because of its lower cost. This "vegetable ghee" may contain trans fat. Trans fats have been shown to increase the risk of coronary heart disease even more so than saturated fats. The term shuddh ghee, however, is not used in many regions as partially hydrogenated oils are marketed as pure ghee in some areas. In India, the sale of fake ghee is stopped by law enforcement agencies whenever a complaint is made. Ghee is also sometimes called desi (country-made) ghee or asli (genuine) ghee to distinguish it from "vegetable ghee". Several communities outside the Indian subcontinent make ghee. Egyptians make a product called samna baladi (سمنة بلدى IPA: [ˈsæmnæ ˈbælædi], meaning "local ghee"; i.e., Egyptian ghee) identical to ghee in terms of process and result, but made from water buffalo milk instead of cow milk, and white in color. Also, during the process, the darkened milk solids are considered a delicacy called morta مرطة, which is a salty condiment used sparingly as a spread, or as an addition on fava dishes. Regular samna is also made from cow milk in Egypt and is often yellowish. Tesmi (in Tigrinya language) is the clarified butter prepared in the country of Eritrea. The preparation is similar to that of ghee but the butter is oftentimes combined with garlic and other spices found native to the area. Tesmi is staple ingredient in Eritrean cuisine. In Ethiopia, niter kibbeh (Amharic: ንጥር ቅቤ niṭer ḳibē?) is made and used in much the same way as ghee, but with spices added during the process that result in distinctive tastes. In North Africa, Maghrebis take this one step further, aging spiced ghee for months or even years, resulting in a product called smen (oedie in the Amazigh language). In northeastern Brazil, an unrefrigerated butter very similar to ghee, called manteiga-de-garrafa (butter-in-a-bottle) or manteiga-da-terra (butter of the land), is common. Ghee is widely used in Europe. For example, Wiener Schnitzel is traditionally fried in a version of ghee known as Butterschmalz. In Switzerland as well as bordering areas, butter was rendered in the old days to preserve the product for several months without refrigeration. "Boiled Butter", as it is commonly called, is used extensively to finish a typical dish of roesti, the Swiss version of hash browns. It gives the dish its distinct flavor. This product is also used in baking of various pastries and cakes as a substitute for fresh butter to enhance the flavor of the products. 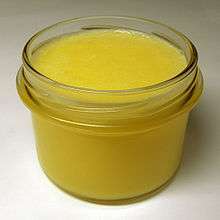 Among Nilotic pastoralist communities in the African Great Lakes region, such as the Nandi, Tugen, and Maasai communities, ghee and flocculated byproducts (kamaek) from ghee-making were traditionally used as cooking oil. In Japan, ghee was mentioned in the Nirvana Sutra, and inspired the creation of Daigo, created from so, a milk skin cheese. ↑ Shilpa (14 May 2007). "How to make Ghee". Aayi's Recipes. Retrieved 24 June 2016. ↑ Fitzgerald, James L.; Adrianus, Johannes; Buitenen, Bernardus. The Mahabharata, Volume 7: Book 11: The Book of the Women Book 12 ..., Part 1. p. 613. ↑ "What are the advantages and disadvantages of butter and ghee when it comes to cooking?". Retrieved May 11, 2015. ↑ "Docosahexaenoic acid content is significantly higher in ghrita prepared by traditional Ayurvedic method". National Center for Biotechnology Information. 2014. ↑ "Health Benefits of Ghee". Spiritfoods. Retrieved 26 June 2012. ↑ "After Neera, Here's Another Healthy Drink - Packaged Vechur Cow Urine". The New Indian Express. Retrieved 27 December 2015. ↑ Pradesh, Andhra (2006-02-22). "`Dalda' sold as ghee in Monda". Chennai, India: hindu.com. Retrieved 2007-03-03. ↑ "Show Foods". Retrieved 27 December 2015.